Supplied: In 10 litre containers of peat free compost, healthy and well established, approximately two meters (7 feet) high, with full planting and aftercare instructions. 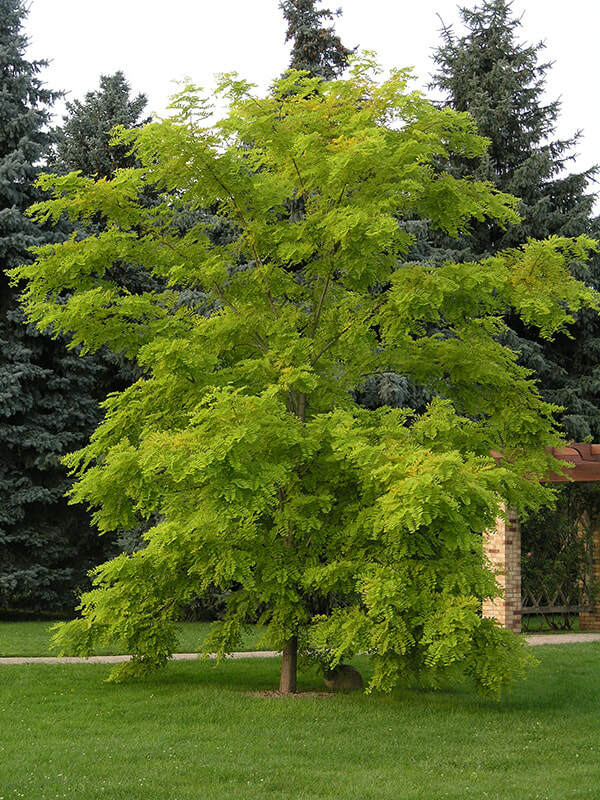 This stunning medium sized ornamental tree is popular for its bright pinnate foliage which emerges clear yellow in the spring, turning lime green throughout the Summer until the autumn when the foliage turns golden yellow before falling. The False Acacia Frisia is also admired for the racemes of white pea-like fragrant flowers which are on show against vibrant foliage in May and June. Dark brown seeds adorn the branches once the autumn colour has fallen, adding additional interest. This attractive feature tree will grow in most positions where exposure to wind is avoided, well drained soils are preferred as are acid soils but chalky soils will also be tolerated very well. Robinia Pseudoacacia Frisia is a striking specimen tree and provides a dramatic splash of colour throughout spring, summer and autumn. A beautiful, upright tree which is deserving of a space in any planting scheme, Robinia Frisia will grow to approximately 8 x 4 metres in 20 years.